Last night I made this AMAZING dinner from a Cooking Light recipe! Even if you don't like scallops, this spinach and paprika syrup would be the most incredible side for another meat besides scallops! Nate couldn't stop saying how good the spinach was (and he normally isn't spinach's biggest fan)! Enjoy and I hope you have a wonderful Tuesday! 1. 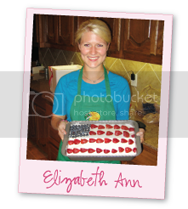 Bring first 4 ingredients to a boil in a saucepan; cook 4 minutes or until mixture thickens. Cool slightly. 2. While paprika mixture cooks, heat a large skillet over medium-high heat. Add 1 teaspoon olive oil to pan; swirl to coat. Pat scallops dry with paper towels; sprinkle with 1/8 teaspoon salt and black pepper. Add scallops to pan; cook 2 minutes on each side or until done. Remove from pan; keep warm. 3. Add remaining 1 teaspoon oil and garlic to pan; cook 30 seconds, stirring constantly. Add half of spinach; cook for 1 minute, stirring constantly. Add remaining spinach; cook 2 minutes or until wilted. Stir in 1/8 teaspoon salt. 4. Divide the spinach mixture evenly among each of 4 plates, and divide scallops evenly among servings. 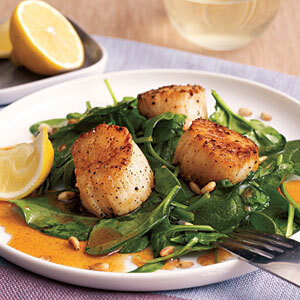 Drizzle paprika mixture evenly over scallops; sprinkle 1 tablespoon pine nuts over each serving. happy tuesday love!!! xoxoxoxoxo just sayin hey!! I am so making this. Ian and I try to go carb-less during weeknight dinners (don't worry, weekends are a totally different story) so this would be the perfect dish. Plus, our Trader Joe's stocks beautiful jumbo scallops!